Anne-Lise Gastaldi began her studies with Anne Queffelec at the Conservatory of Nice and then at the Paris Conservatory, before going on to win several international competitions, among them the prestigious ARD International Music Competition in Munich for chamber music. She is the pianist for the George Sand trio (with violinist Virginie Buscail and cellist Nadine Pierre), which has played for the Folle Journée in Nantes, the Saint-Petersburg International Music Festival, the Teatro La Fenice in Venise, the Contemporary Music Society in Montreal, and many others. Aside from the classics of the trio repertoire, the trio is committed to promoting the music of our time (premiere of a trio by Gerard Pesson in 2010 and one by Michael Jarrell for the Montpellier Festival, forthcoming). Her discography includes a number of works, notably for the Zig-Zag Territoires label (Lili Boulanger, Bartok, Debussy, Korngold, Messiaen, Schumann, among others). She has notably recorded with Michael Lonsdale. Her latest album (January 2012) with the Zig-Zag Territoires label, includes trios by Gabriel Fauré, Maurice Ravel, and Mel Bonis. As a laureate in 2004 of the renowned program "Villa Médicis Hors les Murs" she was part of the Escales Romaines show, which was featured on LCI and partnered with France Musique. She also designed the performance Proust, la musique et la peinture ("Proust, music and painting") in collaboration with the contemporary painter Serge Kantorowicz and the novelist Hubert Haddad. 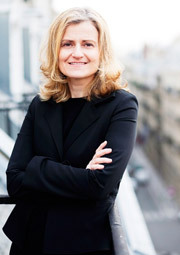 She has been the artistic director of the ClassicaVal festival in the Val d'Isère since 1995, as well as director of collections for Billaudot Ed., professor of pedagogy at the Paris Conservatory, and professor of piano at the Regional Conservatory (CRR) in Paris. Together with Valerie Haluk, she created the Piano Project, the first project of its kind in the world: a collection of piano pieces for students by the great composers of our time (among them, P.Boulez, P.Eötvös, M.Jarrell, G.Kurtag, and others), published by Universal Edition and hailed by the critics (France2, France Culture, and Le Monde).